What crazy things do I do when I am suddenly hungry? Well, all these things distract me from being hungry but I guess they don’t really solve the problem. So, I’ll tell you what solves the problem. 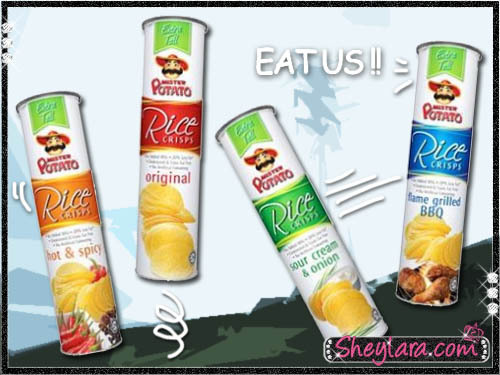 When you’re suddenly plagued with hunger, it’ll be great to have a canister of Mister Potato Rice Crisps handy! They look like potato chips but are actually made from a secret combination of potatoes and rice. Rice is an Asian thing, right, so it’s fitting that we eat yummy rice snacks when we’re hungry, right? Mister Potato Rice Crisps is a healthy snack alternative between meals. Stock a few canisters at home! You might suddenly get hungry while camwhoring. Camwhoring is very tough work, you know. Bring some to the office. People get hungry in the office a lot, don’t they? Or leave some in the car (especially when you’re going on road trips)! Better yet, bring a canister with you wherever you go. Because you never know when you’ll suddenly get hungry. Better to be prepared, right? The texture is almost like potato chips but crunchier. It’s also slightly thicker and more solid, giving you a more satisfying munch. Well, disregarding the different flavours and just talking about the aftertaste of the base chip, I’d say there is a very faint fragrance of rice, which leaves your mouth feeling happy and wanting more. The Sour Cream & Onion is really very good. Love it to bits! Literally! DO YOU WANT TO WIN SOME CASH? 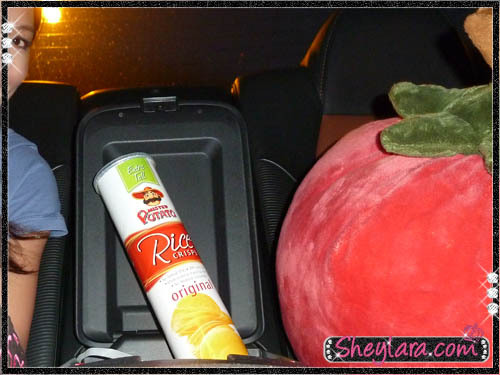 Take part in the Mister Potato Rice Crisp Blogging Contest now! Write a blog on this: “Crazy things you do when you are suddenly hungry”. Step 3: Each post must include a photo of you (the contestant) with two canisters of Mister Potato Rice Crisps (available at any local supermarket). Step 4: Submit your post at the Mister Potato Rice Crisps microsite by Oct 31, 2010. Good luck and happy munching!